This past summer on Lake Champlain, Claire and I had our first chance to use a GPS on the 32 foot Beneteau we chartered. We were looking forward to learning how to use the GPS even though we are comfortable using both the boat compass and our own handbearing compass (which I highly recommend you own) to plot our course and position on paper charts. During our pre-charter checkout (see our free checklist), we noticed that the GPS language was in French (we only know English). Since the charter company, Navtours, is headquartered in Montréal and a high percentage of the sailors at Mooney Bay, NY, are from Canada, this is the norm. What was interesting however, and somewhat comical, was that nobody could figure out how to change the GPS to English (The model was similar to the one shown here). Disappointed, we accepted the boat and figured we would work on it later. With just a little poking around, we were able to figure out enough to make the GPS helpful, even in French. I’m sure the GPS actually kept us from running aground when we entered Sloop Cove for the night on Valcour Island. We cut too close to shore on the north side of the entrance and Claire noticed the shallow area on the GPS plotter. Later we fiddled with the GPS configuration and Claire eventually was able to change the language from French to English. The GPS started out as a luxury, a treat, but turned into a valuable tool, something that actually turned our charter into a more relaxed and even safer cruise than we have ever had before. 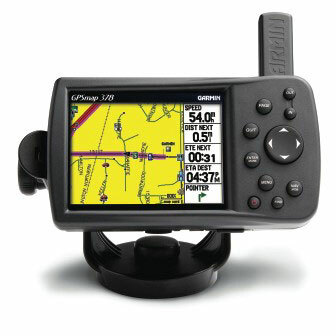 We always planned to purchase a hand-held floating VHF but now we have added a hand-held GPS to our list. For a brief introduction to the GPS (if you are a GPS beginner like we are), check out GPS for Beginners. Please comment on any GPS situations you have experienced on your charters or cruises or any recommendations you may have on portable GPS units. This entry was posted on Sunday, October 7th, 2007 at 12:29 am	and is filed under Navigation. You can follow any responses to this entry through the RSS 2.0 feed. Both comments and pings are currently closed.